During angiogenesis, growth factors stimulate differentiation of endothelial cells and coordinate their sprouting, migration, and assembly into vessels. While the major ligands and receptors that regulate angiogenesis have been identified, the transcriptional factors that underpin these complex signaling processes are not well defined. This week in the JCI, a study led by Gou Young Koh at the Korea Advanced Institute of Science and Technology reveals that sprouting angiogenesis, migration, vascular barrier maturation, and endothelial cell metabolism require YAP/TAZ expression. YAP/TAZ acts as an effector of the Hippo signaling pathway and has previously been implicated in controlling structural and functional maturation in endothelial cells. In the present study, researchers observed high levels of YAP/TAZ expression in the murine retina and brain during the early postnatal period. Selective deletion of Yap/Taz in endothelial cells disrupted vascular network formation in these regions, resulting in blunted endothelial cell sprouting and an overly pruned vascular network (see the accompanying images). Yap/Taz deletion also impaired pathological remodeling of vascular networks in a mouse model of macular degeneration, suggesting that YAP/TAZ may also regulate angiogenesis in disease states. Mechanistically, the researchers discovered that YAP/TAZ supports multiple angiogenic processes by activating actin remodeling and MYC signaling in endothelial cells, supporting structural maturation and metabolic activity, respectively. 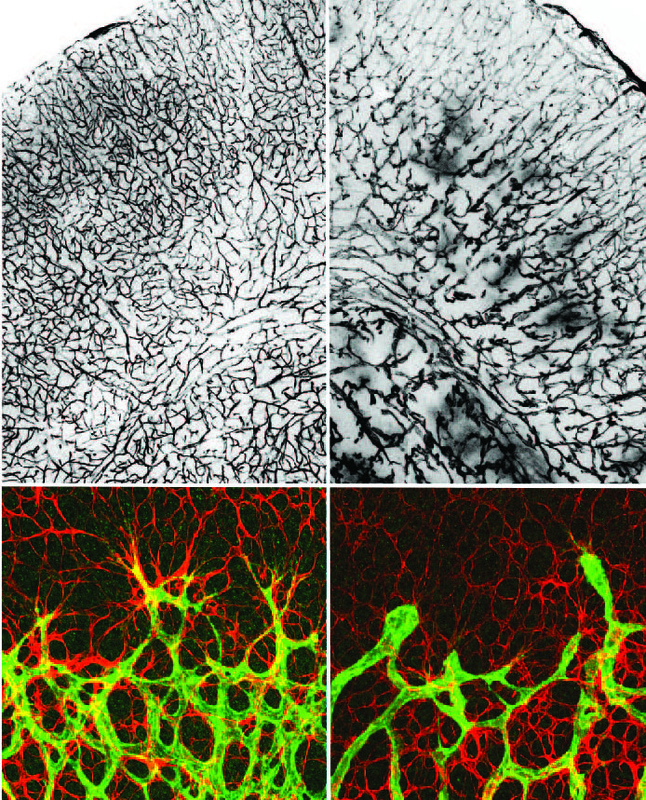 The accompanying images highlight the essential role of YAP/TAZ in coordinating angiogenesis in the striatum and cortex (top) and retina (bottom). Endothelial cells lacking YAP/TAZ (right) displayed profound defects in vascular network formation, with blunted sprouting, enhanced pruning, and impairments in junction and barrier integrity. Citation Information: J Clin Invest. 2017;127(9):3441-3461. https://doi.org/10.1172/JCI93825. Angiogenesis is a multistep process that requires coordinated migration, proliferation, and junction formation of vascular endothelial cells (ECs) to form new vessel branches in response to growth stimuli. Major intracellular signaling pathways that regulate angiogenesis have been well elucidated, but key transcriptional regulators that mediate these signaling pathways and control EC behaviors are only beginning to be understood. Here, we show that YAP/TAZ, a transcriptional coactivator that acts as an end effector of Hippo signaling, is critical for sprouting angiogenesis and vascular barrier formation and maturation. In mice, endothelial-specific deletion of Yap/Taz led to blunted-end, aneurysm-like tip ECs with fewer and dysmorphic filopodia at the vascular front, a hyper-pruned vascular network, reduced and disarranged distributions of tight and adherens junction proteins, disrupted barrier integrity, subsequent hemorrhage in growing retina and brain vessels, and reduced pathological choroidal neovascularization. Mechanistically, YAP/TAZ activates actin cytoskeleton remodeling, an important component of filopodia formation and junction assembly. Moreover, YAP/TAZ coordinates EC proliferation and metabolic activity by upregulating MYC signaling. Overall, these results show that YAP/TAZ plays multifaceted roles for EC behaviors, proliferation, junction assembly, and metabolism in sprouting angiogenesis and barrier formation and maturation and could be a potential therapeutic target for treating neovascular diseases.